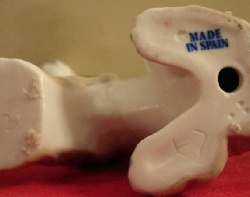 Made in Spain with No Maker's Mark? For years, collectors have been tantalized by items marked "MADE IN SPAIN" but otherwise unattributed. 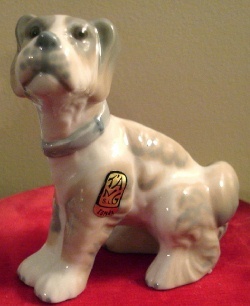 Then, one day, Jorge Luis Gonzalez AAA, Certified Appraiser, sent me several photos (which he has been kind enough to give us for this web site) of a dog model with a Tang sticker and a cobalt blue Made in Spain stamp on the base. We both felt this could well be the missing link in identifying these Made in Spain items with no maker attribution, as stickers are a notoriously impermanent means of maker identification. Subsequently, another collector posted a message to me on the World Collector's Net Lladro Message Board, informing me that she has Teresa Schmitt's puppy model shown on the previous page but with the same gold foil Tang sticker as on Jorge's dog (and the same cobalt blue "Made in Spain" as on the base of both). 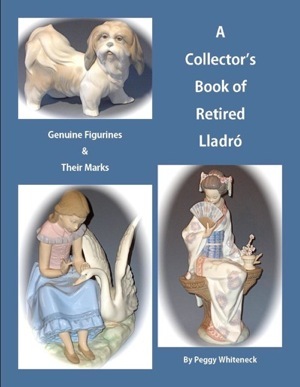 Given the experience of these two collectors, I am willing to concede that most, if not all, of the items marked "Made in Spain" in cobalt blue with no other attribution - including my Borzoi dog grouping pictured on the previous page - are, in fact, either Tang or Rosal, as both are known to have used, at some point[s], stickers for manufacturer attribution. That much of the mystery, at least, appears to have been solved. The Tang sticker on Jorge's dog shows the mark in good detail. This mark is also sometimes found in backstamped and impressed forms on the base. But if it's only marked with a sticker, all that's left is the Made in Spain mark on the base if the sticker comes loose. That seems to explain many, if not all, of the Made in Spain marks found on the secondary market without company attributions but looking remarkably like Lladró products! That solution, however, still begs the questions: When was the item made, and who owned the Tang brand? 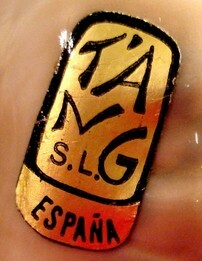 The affinities with the Lladró style might indicate that the Tang brand was owned by one of the Lladró sculptors. It isn't at all clear that employee relations between the Lladró company and its early sculptors were anything other than the loosest of freelance arrangements, at least early in the company's history. It's possible that one or more of these early sculptors had their own early brand lines that Lladró would have wanted to acquire in the process of consolidating its own brand identity. While this is a reasonable guess, I must stress that it remains conjecture. So please, no eBay auction descriptions on these unattributed Made in Spain items that say, "Whiteneck says this is Lladró!" The relationship between Tang and Lladró is indirect at best and would have to have been based upon acquisition rather than invention. Because the attribution of these maker-unattributed items is ambiguous, giving value estimates on them is difficult. My advice for this, as for all secondary market collectibles, is, "If you like it and can acquire it at a price reasonable by your own standards, buy it." 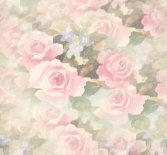 Beyond that, you can establish a value by asking yourself what you'd be willing to let the item go for on resale. There is, of course, no guarantee you'd ever get that for it, but at least you'll know where you stand on willingness to sell and at what price. or through any bookseller by ISBN order #13: 978-0-9845704-6-1.